There comes a time in every person's life when you wake up one morning and say to yourself, "I need to learn more about bottom aerators!" Well if that day is today, we're gonna make your life easy, by telling you what you need to know about bottom aerators. During the summer months, when water is warm, oxygen can be consumed faster than it can be replenished. Lakes can become "stratified"; the warmer, oxygenrich upper water laying on top of the cool, more dense, lower oxygen deeper water. Such conditions inhibit levels of beneficial bacteria and their breakdown of organics. Bottom muck accumulation increased and excessive nutrients are readily available for plant/algae growth. This thermal stratification also makes conditions favorable for the production of noxious ammonia and hydrogen sulfide gases. 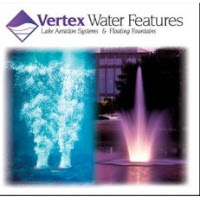 Vertex bottom aeration systems create a vertical current using the rising force of millions of small bubbles to entrain the water column, "turning the lake over" and allowing oxygen to be absorbed at the lake's surface. By moving the lower-oxygen water up from the bottom and eliminating thermal stratification, oxygen levels throughout the water column are increased. Wide swings in oxygen are stabilized, preventing fish kills. Our systems are also made to improve sport fisheries by allowing fish to expand their territory into formerly oxygen-deprived portions of the lake. Now see there...that wasn't so bad, was it? If you appreciate tips such as these, how about subscribe to our RSS feed and we'll keep you updated on the latest in pond management. How can ultrasound help me control the algae in my ponds? Most algae can be controlled using ultrasound. The estimated number of described algae species is about 28500 to 36500, not including sub-species and unknown species that could take the count to more than 100000. The various species are divided into 16 different phyla that provide a way to categorize them. One of the larger phyla is diatoms where there are about 10,000 described species. Green algae comprise another 8,000 species. Blue-green algae or cyanobacteria have another 1500 species. Red algae have another 6000 species. Other types include yellow-green, golden, brown, euglenoids, dinoflagellates, cryptomonads, raphidophyta, haptophyta, eustigmatophyta, prasinopyta, and glaucophyta. Of all these types of algae, we currently know of about 10 basic types of algae that do not appear to be affected by ultrasound, so the odds are good that it will work in most situations. Most plantlike algae will not be controlled with ultrasound. Euglenoids, more a protist than an algae, are not directly affected by ultrasound, although counts go down after ultrasound installation. This is likely due to putting them lower on the food chain. Some colonial green algae are not affected by ultrasound, for example Pediastrum and Scendesmus. Blue-green algae without gas vesicles are not affected. The most common algae can be divided into three major types: 1) green roaming and filamentous, 2) blue-green and 3) diatoms. They bloom somewhat seasonally with diatoms blooming in spring and fall, green roaming algae blooming in early to mid summer, and blue-greens blooming in mid to late summer into early fall. If you have all three types in your water, they will always be present in the water to some degree, though they may not be in a bloom condition. The two most prominent conditions to start a bloom is the presence of nutrients (primarily phosphates in fresh water and nitrates in marine water) and a sufficiently warm water temperature. For diatoms, the presence of silica is essential to produce their silicon based shell structures. The structural parts of the different species allow them to be controlled by ultrasound, but not in the same for each type. Green algae normally have a thicker protective sheath under which lies a membrane called a plasmalemma. It is attached to the surface by a contractile vacuole that regulates the internal pressure and fluid transfer. The ultrasound after sufficient time and intensity causes the plasmalemma to detach from the contractile vacuole. The plasmalemma then collapses inside the cell like an tire inner tube that has the stem broken. It cannot hold pressure and the cell begins to die. This can take three to four weeks to fully occur as bacteria begin to attack the cell internally and begin to devour it from the inside out. When this occurs, the cells typically inflate with carbon dioxide from the bacteria and the algae float to the surface, especially filamentous types. This can make the situation look worse, but it can also provide an opportunity to rake the algae and their decomposing nutrients to the shore for removal from the water. Most blue-green algae have gas vesicles, tiny gas filled tubes that allow them to float. The structure of these was not fully understood until the early 1970’s. The structure is very fragile being only one protein layer thick. Because they are so easily damaged by the high frequency ultrasonic sound waves, the technology has a much greater reach for them than the green algae and diatoms and can control a region about 7 times as large. Breaking the gas vesicles makes the blue-green algae heavier than water, so they sink out of sufficient light to be productive and where they eventually die. Blue-green algae like Oscillatoria and Lyngbya that don’t have gas vesicles are not impacted by ultrasound. Diatoms are a silicon shell species of algae. Diatomaceous earth, a filter media, is taken from deposits of dead diatom shells. The shells have multitudes of tiny holes that work to filter materials effectively. The ultrasound appears to damage the diatoms at the same range as for green roaming algae. It is more difficult to see the physical damage done beneath the silicon halves, but it is likely that the central vacuole beneath the shell is damaged or valve process of moving fluids is disrupted. 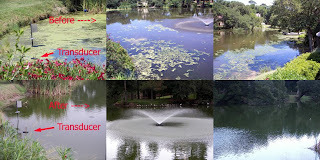 Ultrasound can be a useful method to control algae in your pond. It has some limits based on the type of algae you have. We can help you identify the algae you have and give you a good idea on the probability of success. A healthy pond is a pond where excess nutrients are prevented from entering or eliminated from the pond. The water is balanced with respect to alkalinity and hardness, it has a fairly neutral pH, and has sufficient oxygen levels, especially if fish are present. There are a number of ways to achieve these things and they can be done for the most part without using harsh chemicals in your water. Exciting news here at South Santee Aquaculture! Tune into ETV tomorrow night (Saturday) at 7:30 pm for a featured show on our company and aquaculture in South Carolina on The Big Picture. Alternatively, you can visit the ETV site and watch the full broadcast on your computer or just watch it below in our blog. South Carolina’s seafood business is a huge economic driver in our agriculture industry. The Big Picture looks at an initiative that pushes local vendors and restaurants to exclusively purchase homegrown, fresh, SC seafood. Every Friday morning "The Big Picture on the Radio" airs on ETV Radio. Discussion focuses the television topic of the week amongst other timely subjects. Be sure to check 'The Big Picture' homepage each Friday afternoon to tune in live starting at 1:00 p.m.
Kevin Hutchinson, Freshwater & Fisheries Biologist, created the Water Trifecta methodology for “environmentally friendly / Green” water management practices. We partner and cooperate with Mother Nature with these three sound principles which work in synchronicity. We encourage common sense water management practices by following this strategy. 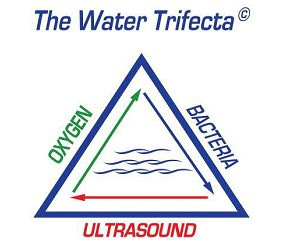 The “Water Trifecta©” is a sound methodology. Ultrasound: Install an ultrasound algae control transducer to kill the majority of algae types that are prone to bloom in your pond. Help prevent new algae spores which are introduced through wind, rain, or from a stray ducks foot from catching hold. Ultrasound waves prevent new algae blooms from occurring and also help reduce the biofilm in the water where algae attach and grow. Ultrasound also is effective in stimulating the transfer of nutrients in and out of bacteria cells which will increase the rate in which decomposition of sludge happens. Bacteria: Add beneficial bacteria to your pond to consume the nutrients and consume suspended solids in the pond. Bear in mind that bacteria breathe oxygen and give off CO2. Adding beneficial bacteria to a pond must be coupled with aeration to provide proper oxygen levels for the bacteria to consume. Beneficial bacteria are the good “bugs” who consume what is decomposing in your pond. better....we have a separate store on Shopit for our products, for those of you who may be anti-ebay for whatever reason. You can find the same great products on our Algae Control store on Shopit.